SONAR Sink 25 Cold & SONAR Sink 30 Cold from Scientific Anglers on Vimeo. Great article about steamer fishing featuring good friend and fellow guide Russ Maddin. 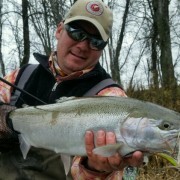 Russ, shares a few of this beliefs about streamer fishing. 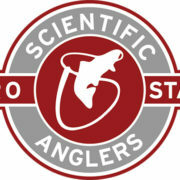 Check out this article, it will help you become a better streamer fisherman. 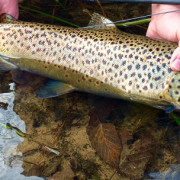 NO matter the species you chase, from brown trout to muskie. Check out the latest VOD featuring Russ Maddin, tying his Flash Monkey baitfish imitation. Thank you Russ for sitting down with us, and sharing this pattern. 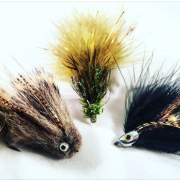 More than just a fly tying video. Check it out, and let us know your thoughts. This fly tying video is another instructional in our series of videos that you can view at our Videos on Demand page, check out other titles to expand your fly fishing education. Thank you for your continued support, and don’t hesitate to let us know what additional videos you want to see. Flash Monkey by Russ Maddin from Mangled Fly Media on Vimeo. The Flash Monkey by Russ Maddin, is the latest streamer pattern from the creator of the popular Circus Peanut, Mad Pup, and South Bound Trucker. As in the past, Russ continues to push the evolution of fly tying – this pattern combines new materials from FlyMen and Hareline Dubbing with traditional hackles from Whiting Farms. Requiring over 2 years to perfect, the Flash Monkey needed to meet Russ’ strict streamer standards. Countless trips to the river testing the Flash Monkey ensured it was properly balanced and moved in the river currents for maximum effectiveness. This video is more than a simple tying demo. 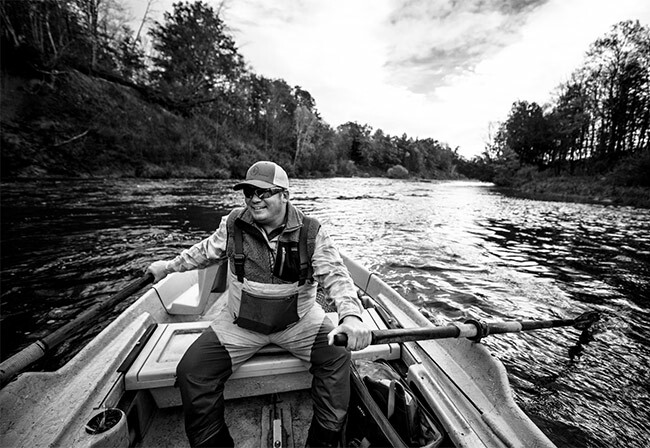 It breaks down the Flash Monkey and gives you full access into the mind of fly designer, fisherman , and river steward Russ Maddin. 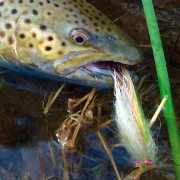 As he discusses his methods of tying, how to fish the pattern, and more. 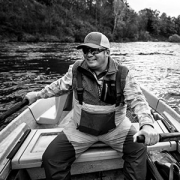 It also includes Q&A with Jon Ray discussing several retrieves to bring this fly to life, the best Scientific Anglers fly lines for the pattern, and how to build your leader to get the most out of your fly. No matter your experience level you’ll learn something from this video. If you’re into streamer fishing – no matter the species – this is a must-watch video. Thank you Russ Maddin for letting Erik Rambo and I film a step-by-step video instructional of your Flash Monkey. More coming soon…..
Gunnar makes reference to Russ Maddin, and one of my personal favorite streamer patterns the Circus Peanut. Check out the link to the detailed how-to-tie video we did with Russ Maddin. Circus Peanut with Russ Maddin from Mangled Fly Media on Vimeo. The Circus Peanut has been a staple in the Russ Maddin fly box for years. The Circus Peanut orginated in Northern Michigan over a decade ago and is now fished all over the world. Many streamers by many famous fly tiers have followed this same template. Russ sits down with Jon Ray from Mangled Fly Media and shows his step-by-step process. This video breaks down the Circus Peanut and gives you full access, into the mind of fly tier, fisherman , and river steward Russ Maddin. As he discusses his methods of tying, color matching, and setting up one of the best streamers of all time. No matter your experience level you will learn something from this video. If your into streamer fishing no matter the species this is a must watch. Had the pleasure of fishing with Russ Maddin yesterday fellow guide and Scott Pro Staff member. Even though Russ and I live in the same town and work for the same company, Hawkins Outfitters. With what I call “life” consuming so much of our time, days spent together on the water do not happen enough. So getting a chance to watch one of the fishiest kids I know go to work with a streamer rod in his hands. Is a great day on the water. Russ by far has some of the sickest streamer patterns around for trout, and the smallmouth loved them too. With August here at our door step some of the best river smallmouth fishing of the season is upon us, check out my new DVD for additional flies, tactics, and pointers on catching more smallmouth in a river. Last week during one of the strong thunderstorms that rolled through our area. Had a chance to sit down with Russ Maddin and Alex Lafkas, and talk about fishing and watch them tie up a couple patterns. Hope to get a chance to edit the video I shot with Russ on the vise, with one of his signature patterns the Circus Peanut. Listening to Russ and Alex talk about patterns and techniques is an experience everybody should get a chance to have. Monitor the blog for a the video post over the next couple weeks, listening and watching Russ tie will help everybody create better streamer patterns. Thank you Russ for sharing this pattern. If you do not have the Peanut in your arsenal you should!